Delia – When I clicked on the survey link it told me what I was looking for wasn’t found. I’m not sure if I did something wrong or not. You can send link to my gmail address if you like. The link is not working. It takes you to the home page of Survey Monkey and not your survey. hey thanks so much. can’t fix this now but will do so later on and post a new link. sorry! Ditto: I ended up at a home page that wanted sign ins and did not mention RealDelia. Thanks everybody. Apologies for the error. I’ve fixed the link so please do try again! how strange, ruth. i just tried it and it did. and I see that quite a few people have completed it. i think I’ll email it to you directly. sorry about this and thanks for your interest! I could not get the survey to work either..
Save me emailing you .. I hope it’s ok if I credit you .. and use your Friday 8th Oct post Recommended Reading for the Weekend …. Art Timeline .. while you’re away .. “3. For a beautiful visual history of modern art, have a look at the Modern Art Timeline. Way Cool.” That bit .. full links etc .. hope I get to it ..?! 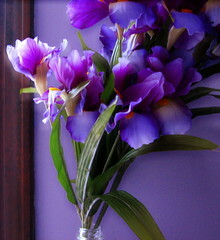 Definitely worth syndicating your posts .. they’re great .. and I love the Iris photo ..
Hi Hilary. Thanks-no problem and you don’t need to ask for permission-just link away!